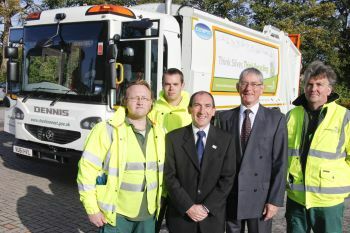 Cheshire East Council’s new fleet of Refuse Collection Vehicles (RCV’s) have been installed with 360° Hard Disk Recording camera systems, reversing radar, LED strobes and front & rear facing LED light-boards, in a bid to mitigate insurance claims and provide evidence regarding any complaints made against crews. The safety technology has all been supplied and installed by vehicle safety experts, Innovative Safety Systems Ltd (ISS). Ray Skipp, Waste & Recycling Manager, Cheshire East Council said: “These new safety features have been welcomed by our crews and the unions. Previously, if a claim was made for damage to property or an allegation against a member of staff, we had no way to validate the claim without independent witnesses. Now we have a record of what really happened. Cheshire East is the third largest unitary authority in the North West after Manchester and Liverpool with a population of over 360,000 people. Based in Leicestershire, ISS is a one-stop shop vehicle safety and efficiency provider encompassing product development, supply, maintenance and service. ISS products include reverse camera systems, vehicle CCTV, hard disk recording (DVR), reversing radars, fuel saving, vehicle tracking, LED lighting and warning beacons. The new fleet, comprising 6 Dennis Eagle RCV’s with Terberg OmniDEL bin lifts, was sourced by vehicle and plant contract hire provider, TransLinc, who supply the council with a wide range of vehicles including grounds maintenance and service vans. The fleet will replace trailer and stillage recycling vehicles.